AMSTERDAM, The Netherlands, Oct. 14, Chinese Premier Li Keqiang arrived here on Sunday for an official visit to the Netherlands, the first by a Chinese premier in 14 years. 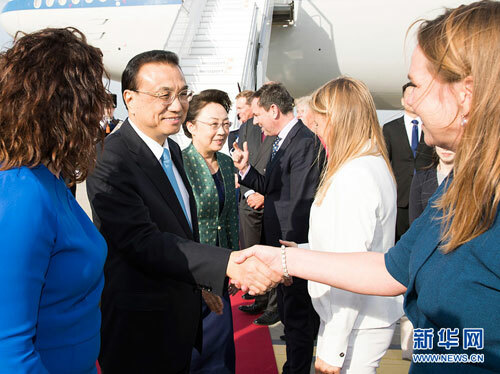 It is also Li's first trip to the European country as the Chinese premier. The Netherlands is one of the first western countries to establish diplomatic ties with new China and the two countries decided to build an open and pragmatic partnership for comprehensive cooperation during Chinese President Xi Jinping's state visit in 2014, said Li in a written statement upon his arrival. It is the second stop of Li's Eurasia trip from Oct. 11 to 19. He has paid an official visit to Tajikistan and attended the 17th meeting of the Council of Heads of Government of the Shanghai Cooperation Organization in Dushanbe, and will fly to Belgium for the 12th Asia-Europe Meeting (ASEM) summit and a working visit.